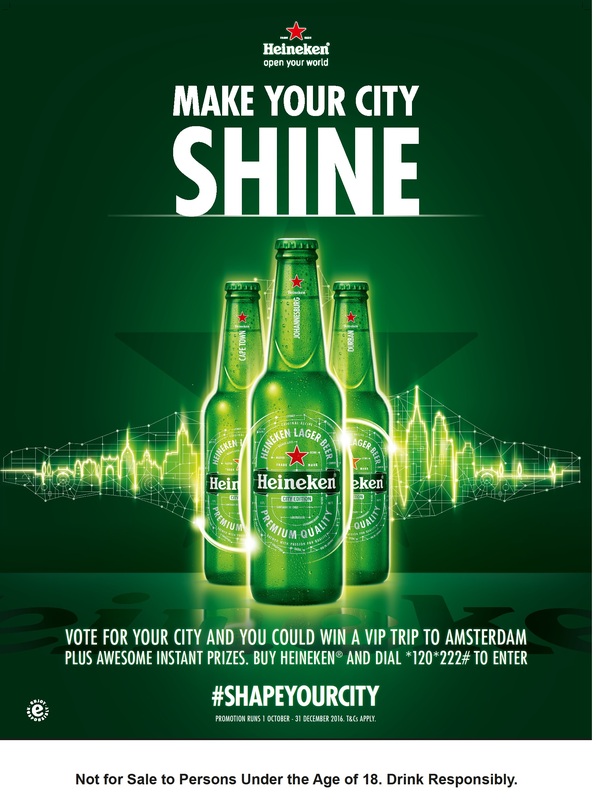 Vote To Transform Your City In Heineken®’s #Shapeyourcity Campaign! Heineken®, the world’s leading international premium beer, is on a global quest to transform the cities of the world and is shining the spotlight on South Africa’s hottest cities this summer. Not only have our local metropoles taken their rightful place on Heineken® bottles country-wide, but they’ll also be competing head to head in an epic #SHAPEYOURCITY competition. The competition is on between three of the country’s hottest cities – Johannesburg, Durban and Cape Town – but it is your vote that could ensure that your city shines the brightest! The winning city will see an iconic and epic experience, capturing the imaginations of residents and letting them see their city in a totally different way. To achieve this, Heineken® South Africa has partnered with three “City Shaper” teams – urban visionaries who have, by small actions of their own, contributed to shaping cities across the rainbow nation. These City Shapers are standing by to reward South Africa’s favourite city – and its people – with a mind-blowing experience. “Your city is your canvas. When you add to the city, you not only make it better for yourself, you also motivate others to do the same. We want to ignite the imagination of a new generation of city dwellers, inspiring them to shape their cities,” says Themba Ratsibe, Marketing Manager, Heineken® South Africa. Grab your limited edition Heineken® bottle, find the unique code under your bottle cap and dial *120*222# to enter your code and vote for either Joburg, Cape Town or Durban as the city you’d like to see receive a City-Shaping experience. By voting, you stand the chance to win the trip of a lifetime to Heineken®’s home city, Amsterdam, and some awesome instant prizes. Follow #SHAPEYOURCITY to stay part of all the action on social media. HEINEKEN® Not for Sale to Persons under the Age of 18. Enjoy Responsibly. Captain Morgan takes over AKA’s Spring Fiesta stage at Captain O’ Clock! Black Coffee to host biggest urban event of 2016!